Playtech have just released a new online slots series based on the Greek Gods. 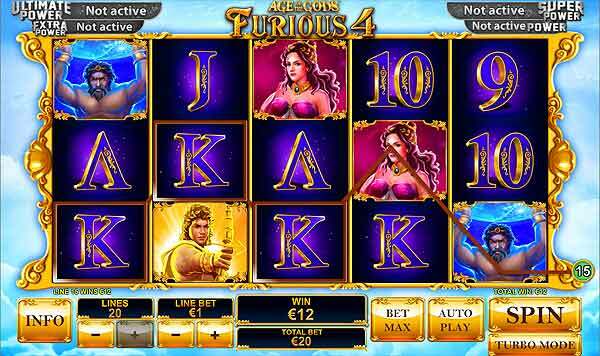 This series currently has four video slot games and carries a progressive jackpot element across the games where you can win POWER, EXTRA POWER, SUPER POWER and ULTIMATE POWER jackpots. The three games are very sikmilar and feature the same characters, but all have slightly different bonus options and features. The four games are Age Of The Gods, King Of Olympus, Prince Of Olympus and Furious 4. 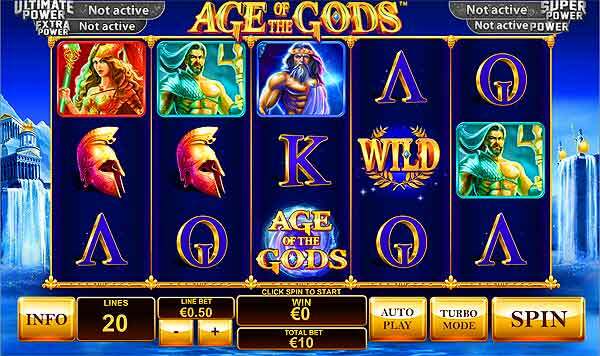 Starting with Age of the Gods, this is a 20 payline video slot that features the five different gods and 2 bonus games with 4 FREE SPINS modes, Athena, Zeus, Hercules and Poseidon. The second game in the series follows the same theme with the same jackpots but the gods in question are Apollo, Pandora, Hephaestus and Atlas. There are four great free spins modes with extra wilds and random multipliers. There is also the AGE OF LIGHT feature, AGE OF CURIOSITY feature, AGE OF FIRE feature and AGE OF ENDURANCE feature that all give extyra bonus cash prizes. This third game in the series will really blow your mind. The graphics are sharp and the bonus play is frequent. This is a 25 payline slots game and feature wilds and scatter symbols. The bonus is a FREE SPINS with increasing multiplier, multiplier starts at x2 and increases by 1 every 2 spins. The 10 free spins also come with fixed sticky wild in the center of the reels. This is very similar to the King of Olympus but in this game you are the Prince Of Olympus, HERCULES. The game has 25 paylines and a couple of bonus features to win you free games and some bonus cash prizes. 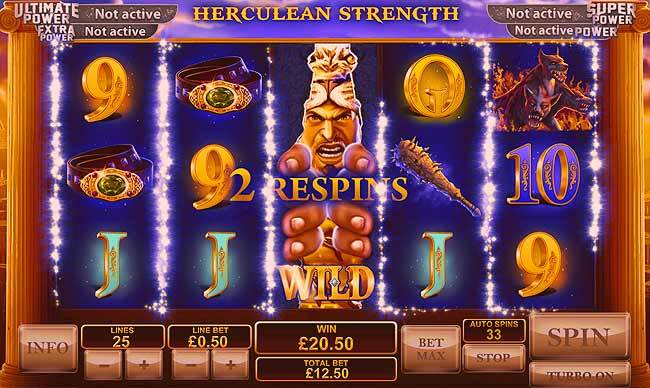 There is also the HERCULEAN WILD RESPINS which come with prize win multipliers. 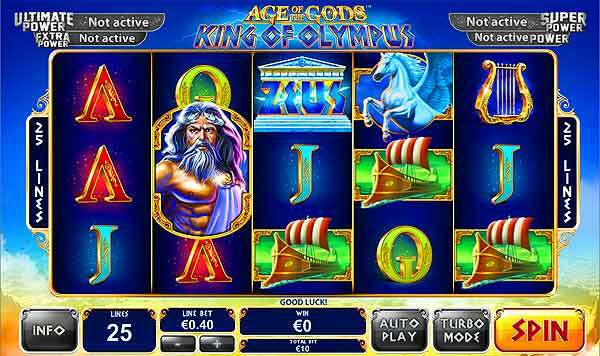 This is a fun online video slot game from Playtech, the game offers WILD, SCATTER and BONUS symbols and there is the AGE OF GODS power jackpots that can be won. The SCATTER symbols will win you 10 FREE SPINS with a 3x multiplier. This is a fun series of video slot games that can be played immediately with our great welcome bonus, at Casino Tropez, TitanBet or Casino.com. Hit the "PLAY NOW" button below to get to the casino and register.